The fourth estate has abandoned its sanctity. he should have run them down. News came to hand the other day that another news channel in Australia has attempted to create the news yet again. The Seven network flew a family of trouble making muslim ingrates to France where they deposited them on a crowded beach wearing burkinis, the intention being to film the “racist” reactions from the unsuspecting locals. Unfortunately things didn’t go to script as the locals weren’t cooperating, and Seven was forced to utilize devious camera techniques and sneaking editing to get their prearranged story. Keep in mind that the beach in question was in Nice which you may recall was the scene of a rather nasty terrorist truck attack not so long ago. This follows on the heels of the Nine network’s attempt earlier this year to fly a news crew to Lebanon where they undertook the kidnapping of a woman’s children from her estranged husband. The man discovered the plot due to the network’s incompetence and had the gall to recover his children and utilize his contacts with the local police to get the film crew jailed. In this example channel Nine attempted to construct a news story that had some basis in truth, however tenuous. The woman did want her children back and might have attempted the feat whether or not the network had been present. Still, they were rightly criticized for attempting to insert themselves in the story, a real life example of breaking the fourth wall. But channel Seven’s antics on a French beach is something entirely different and much more serious. This was a deliberate attempt at mischief-making with the sole objective being to denigrate the reputation of France and French people on television, who incidentally had not given permission to be filmed. It was Candid Camera 21st century style, but unlike that program the intention was not to have a laugh at those unfortunate enough to be caught on film but to publicly pillory them for unproven and wholly invented prejudices. It took another news outlet, The Australian newspaper, to publicly break the story, which unfortunately had already gone viral around the world as it was intended to do. “Islamophobia in France!” screamed the headlines and Seven could pat themselves on the back for another job well done. They don’t report the news, they are the news, and what we watch will be whatever propaganda line they decide they wish to invent. The photo at the top of this piece I sourced from an article at The Other McCain concerning the Black Lives Matter riots in downtown Charlotte, another public disturbance created by activists with the implicit support of CNN that placed the lives of ordinary people in unnecessary danger. But the photo is not of the recent riots but of another infamous riot of twenty five years ago, the Rodney King riots in Los Angeles. 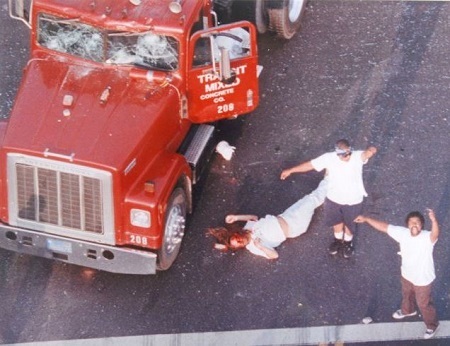 The bloodied man on the ground is truck driver Reginald Denny who was almost beaten to death by the rioting mob. Young people have no memory of the 1992 riots, which were arguably caused by CNN’s dishonest editing of the video in which Rodney King was arrested by Los Angeles police. If you watched the full-length video, and knew that Rodney King was under the influence of PCP at the time he was confronted by police after a high-speed pursuit, you realized that the baton-wielding police were dealing with a dangerously violent suspect who had already been tazed and was still resisting arrest. CNN has form with regards to these public manipulations. The question is when will networks be made accountable and responsible for such obvious and outrageous falsifications of the truth? Much is made by the press themselves about the sanctity of the press, but that old line is wearing thin, and with a recent poll showing that just 6% of people say they trust the media perhaps it is time for some of their privileges to be revoked. How a network such as Seven can perform such deliberate public mischief and retain their operating license is beyond me. The perpetrators of these attempts to undermine community harmony and goodwill for commercial profit should be hounded out of existence. Perhaps a fitting punishment would be to deposit them on a beach in Saudi Arabia wearing bikinis and mankinis. Corto Maltese – Beauty & Masculinity. Trump will “lose” the debate.